The Relief Teacher: First week back? Bring it on! As the holidays draw to an end, I can't help but get the jitters thinking about the new students and the new classrooms I'll be visiting this year! To begin the year I have a 2 week block - YAY - on a year 5/6 class, so being as organised as I always am, I've already begun prepping! With the school term beginning only a few days after Australia Day, I feel like there is no better time to teach deep and meaningful lessons about Australian history. 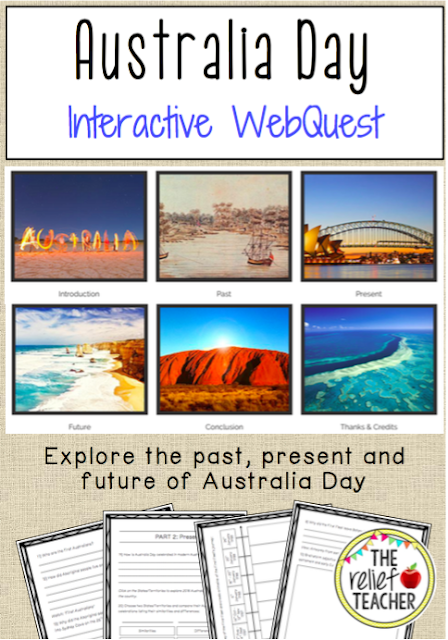 With this in mind, I've created an interactive WebQuest about Australia Day. It has taken quite a long time to make this resource, as I created the webpage, sourced all of the information and then created an accompanying question booklet and answer key, BUT it has all been worth it, I'm so excited to get back into the classroom to teach it! To complete their quest for knowledge, students navigate through the past, present and future, learning about the European and Aboriginal history behind Australia Day, exploring modern day traditions and considering the future of Australia Day. As students progress through their quest, they will view videos and maps, explore early European artwork and navigate websites to answer a range of short and long answer questions, create a historical timeline and complete written tasks. Purchasing this product provides you with exclusive access to the WebQuest website and accompanying WebQuest question booklet and answer key. For the first week this product will be only $4 - down from $4.50 - so grab it ASAP! I hope you find this product helpful! Let's bring on the first week back!